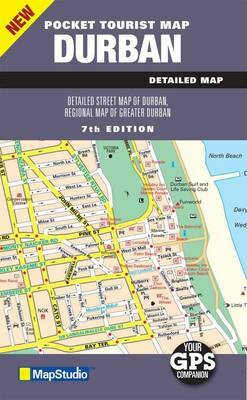 This updated edition pocket tourist map of Durban at a 1: 12 500 scale shows main and minor roads, retail and industrial areas, traffic light positions, hotels and accommodation, tourist information, theatres and cinemas, shopping malls, parking, one-way streets, sport and recreation areas, railways and stations, suburb names, an index of street names and a detailed inset map of uShaka Marine World. A detailed Durban regions and surrounds map at 1 : 100 000 scale includes La Mercy, uMlanga, Inanda, KwaMashu, Kloof, Mariannhill, Queensburgh, The Bluff, uMlazi, aManzimtoti and Illovo. Shows suburbs, main routes, shopping malls, airports, industrial areas, hospitals, parks and reserves. The maps shows suburbs and main routes, shopping malls and airports, industrial areas, hospitals, parks and reserves.